With our ever increasing need to help Klal, as well as ourselves and our families, we are increasing our efforts to get Kavanah Kards and Mindful Mitzvahs materials into the hands of English and Yiddish-speaking children, who are forming their tefillah and kavanah habits daily. In addition to yeshivas and high schools listed below, the Kids Kavanah Kards offer primary and middle school students a fun, interesting way to help younger children create positive feelings toward mitzvahs and davening. They are excellent to use when teaching lessons on tefillah and kavanah. The Interactive Kavanah Kard gives children who are starting to daven a fun activity to decorate and customize their personal Kavanah Kard to enjoy and to enhance their davening daily. With secondary schools, the Belz girl's High School in Belgium joined the growing list of yeshivas to bring Kavanah Kards "to school" with their program on tefillah in June last year, in which Yiddish Kavanah Kards were given to the entire school. The Mindful Mitzvahs Campaign with Kavanah Kards are a perfect vehicle to teach lessons on kavanah and tefillah, and help students establish the proper approach to mitzvahs and davening from the outset. To get them for your institution or organization, please email KavanahKards@gmail.com or call 1-917-309-4942. If your organization wants a special printing with the organization's name & dedication on it, please let us know. This year Kavanah Kards in English and Yiddish were distributed to the 1600 participants of the convention. We made this commitment to get them to administrators and educators as a unique tool to give the next generation of Klal Yisroel more kavanah and a closer relationship with Hashem. In order to do this we invested to have 1600 envelopes printed and filled with 12 Kavanah Kards each, plus a cover letter. May Hakodosh Baruch Hu bless us to be zocher to do His will b'simcha! "We had a grade 10 Luncheon having to do with a topic from our Novi curriculum. The theme was רחמנא ליבא בעי and we had the girls prepare and perform: choir, video presentation, game, banner, memento... Mrs. Cziment and I gave the cards to the girls as a memento. " 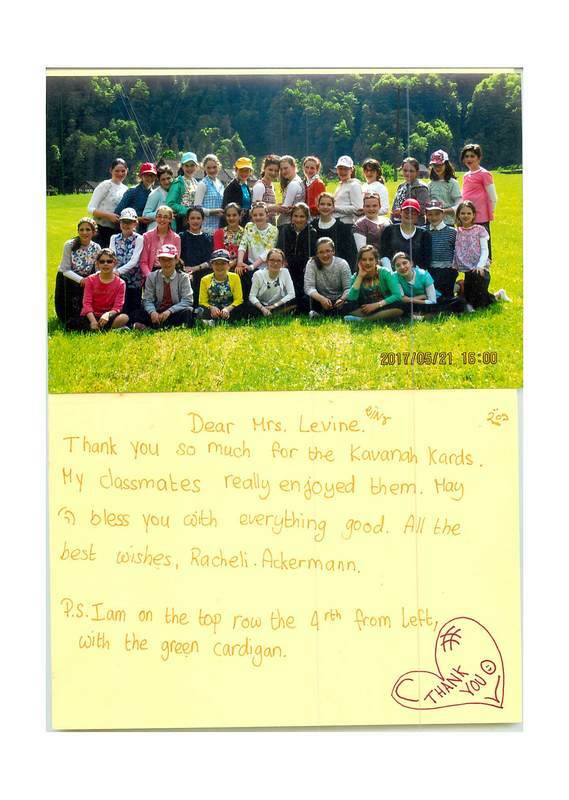 Picture and thank-you note from girls in a yeshiva in Switzerland who got Kavanah Kards when one of their classmates called to request them.